The United States military has to do more with less. With the official end of the war in Iraq last December and the military drawdown ongoing in Afghanistan, there are fewer boots on the ground. Yet, the troops that remain in theater still need to gather information, communicate with personnel in the air, at sea, and on land, and perform their missions. To do so, they rely heavily on military satellite communications (MILSATCOM) with worldwide connectivity required for everything from checking emails to downloading high-definition intelligence, surveillance and reconnaissance (ISR) video. As is the case with any communications network, whether terrestrial, satellite, or communications-on-the-move (COTM), the design must start with a firm understanding of the user application and requirements. These end-user applications often require high bandwidths that must be supported on a fast moving aircraft using a very small antenna, while providing global coverage under stringent communications security (COMSEC) and transmission security (TRANSEC). With this reality comes a host of challengesfrom securing information on a global network to supporting the bandwidth required to transfer large imagery files. 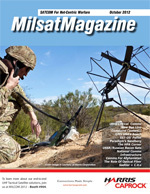 MILSATCOM technologies are answering the call, providing cutting-edge solutions and helping troops ensure mission successes and the saving of lives. One example is the development in the areas of airborne SATCOM, and how those developments are being used to enhance critical military ISR missions. Combined with COTM technology, airborne SATCOM allows commanders to securely communicate with troops dispersed globally in remote regions. Advances in the speed and throughput of satcom equipment have made high-definition video a reality for airborne applications. iDirect Government Technologies (iGT) is certainly at the forefront of designing satellite communications technologies that improve our militarys ability to conduct day-to-day operations while keeping updated information on our nations enemies. For example, consider iGTs latest satellite airborne router, the e8000 AR, which provides military customers high-speed communications on a variety of transport and ISR aircraft platforms. Features include an intelligent antenna integration processor to support any vendors type of antenna system; integration into both low-speed and high-speed military airframes which support multiple missions from a single satellite router that can be connected into an existing iGT regional or global satellite network; a lightweight frame that weighs less than 16 pounds; aircraft grade 38-999 connectors for all RF and Ethernet inputs; high-speed COTM capabilities with the iDirect IP network delivering voice, video and data applications to and from personnel on board the aircraft; and spread spectrum technology that allows waveform spreading to meet Power Spectral Density (PSD) requirements while maintaining the same data rate. The router also includes both AC (100V to 240V, 50Hz to 400 Hz) and DC (28V) inputs, enabling it to be easily powered from an airplanes native power buss, eliminating power converters that may produce dirty power. The entire unit is designed and tested to meet MIL-STD 810G airborne environmental standards and MIL-STD 461G standards for electromagnetic interference and radiated emissions. The e8000 AR routers have flown on multiple military airframes, including the King Air C12 surveillance aircraft and the high-speed C17 transport aircraft, supporting numerous military missions. The routers can be optimized for downstream or upstream data rates using either Deterministic Time Division Multiple Access (D-TDMA) or Single Channel Per Carrier (SCPC) operational modes. The router can be operated in either mode and switched by the operator to suit the mission. For bandwidth-intensive ISR applications, the e8000 AR can be operated in SCPC mode where as much as 19Mbps can be transmitted off the aircraft in the upstream path. These data rates can support multiple high-definition cameras for surveillance and sensor data from on-board video and sensor-gathering equipment. The e8000 AR can be operated in D-TDMA mode for improved bandwidth efficiency and achieve transmit data rates as high as 11Mbps upstream from the aircraft, depending upon satellite link budget limitations. Router data rate performance on aircraft platforms are antenna and satellite frequency band dependent. The e8000 AR is designed to operate in any combination of antennas and satellite frequency bands, including wideband global satellite constellation, to provide optimum performance to the operator. The e8000 AR has a built-in open antenna modem interface protocol (OpenAMIP) to interface with airborne antennas antenna control unit, which provides real-time location and pointing information during flight. For antennas without OpenAMIP, the e8000 AR includes an on-board CPU with an applications interface for custom antenna development. The CPU comes with a thin-Linux operating environment that can be accessed through keyboard, video and mouse interface, front-panel universal serial bus, or Ethernet port. Some frequency bands, such as Ku-band, have adjacent satellite interference (ASI) requirements due to decreased satellite spacing that can limit the power spectral density (PSD) transmitted from an airborne antenna system. On other satellite frequency bands such as X-and Ka-Band, ASI is less of an issue due to increased satellite spacing and allows much higher transmit power in the airborne antenna system. The e8000 AR takes advantage of this higher power operating environment and can be operated without waveform spreading, and uses SCPC mode where iDirect routers have achieved data rates upstream from the aircraft as much as 14 Mbps from a 17-inch airborne antenna. The military has a need to achieve bandwidth efficiencies as well as a need to prioritize voice, video and data traffic coming in. This Multilevel Precedence and Preemption (MLPP) provides multiple levels of prioritization through strict priority queuing and group quality of service (QoS). This capability exceeds the QoS capabilities of commercial grade satellite products on the market today but is required on MILSATCOM networks. Another MILSATCOM technology that is helping to improve military COTM missions is the global network management system (GNMS), developed by iDirect. The system allows a single COTM remote to have multiple instances in teleports around the globe. GNMS is flexible enough to allow IP and satellite networks to remain fixed while allowing for differences in configuration across different beams. In order to maintain fixed IP network architecture when the antenna re-points, the modem and the router re-homes to the new hub. The e8000 AR and GNMS work together to make this physical transition nearly seamless. GNMS is a solution that fixes a challenging aspect of COTM remotesswitching from one beam to another. Beam switchover requires the ability of the remote to determine when and to which beam to switch as well as communication with the COTM antenna. To determine the optimal point at which to switch beams and the best beam to switch to, iDirect developed an Equivalent Isotropically Radiated Power (EIRP) map server. The map server holds the familiar contoured EIRP satellite maps. The remote, having access to latitude and longitude information from a Global Positioning System is coordinated with the EIRP map server and determines the appropriate place and time to switch beams. We have come a long way in military communications capabilities. We have improved the way and speed in which troops receive and share information. We have done so, even as the numbers decrease and troops shift from Southeast Asia to new deployment areas. Karl Fuchs is Vice President of Technology for iDirect Government Technologies (iGT). Mr. Fuchs, who has more than 15 years of expertise in the technology, federal government and satellite industries, has been a featured speaker at leading industry conferences and events, including the DoD SATCOM User Workshop, ISCe, IBC, Pacific Telecommunications Council. IWCE, Satellite and Emergency Management Talks.